Max Brooks' World War Z:An Oral History of the Zombie War is one of my favourite novels of all time, and while I've made no secret of my disdain for the movie adaptation (blasphemy! ), I will happily gobble up anything else that's written by him (zombie-themed or not). The Harlem Hellfighters: A Graphic Novel is slated for release in April 2014. 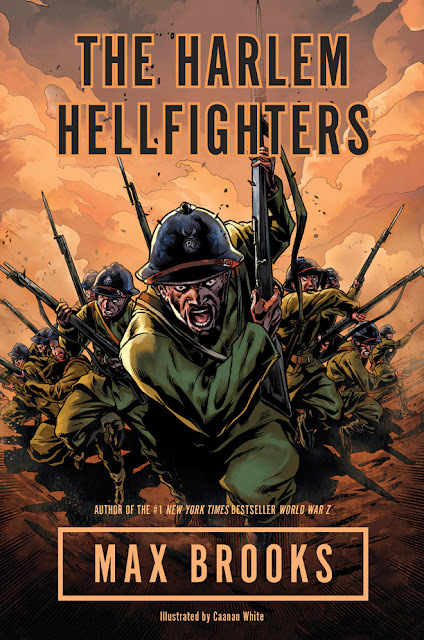 The 369th Infantry (of which the Harlem infantry in WWZ is loosely based off of) was an African-American regiment from Harlem and one of the most decorated regiments during WWI. Brooks shares their obscure tale. Cool cover. I have World War Z and plan on reading it soon. World War Z is up there as one of my favourites. If you like it you should definitely give the audiobook a try too. There are some AH-MAZING narrators for that book!